You are here: Home » MEDIA » Books » The Reapers Are The Angels by Alden Bell (book review). The Reapers Are The Angels by Alden Bell (book review). 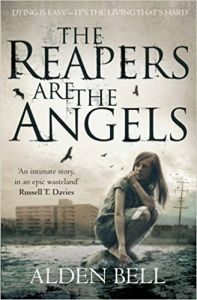 ‘The Reapers Are The Angels’ is a standalone dystopian novel, set in a post-apocalyptic world. After a worldwide epidemic, most of the population has been infected with some sort of virus, which has turned them into flesh-eating zombies. While the origins of the virus is never revealed, we do know that it is transferred through a bite which takes around a day to turn humans into mindless zombies. The infected move slowly and are only killed by damaging their brains or beheading. Temple is an entirely self-sufficient fifteen year-old girl living alone in apocalyptic America. At the beginning of the novel, she has been living alone and avoiding all human company in a lighthouse. When a zombie floats onto her beach, she decides it is time to move on and drives to a city, where she is found by a hunting party of a local community. They live in four groups in connected high-rise buildings and have formed a semblance of society with everyone pitching in to do their part. Temple is attacked by one of the hunting part, Abraham Todd, whom she accidentally kills while trying to subdue him. Abraham’s brother, Moses, is dangerous and a formidable tracker who intends to avenge his brother by killing Temple. After escaping the community, Temple meets a group of travelling hunters who inspire her to travel and see the Niagara Falls but, with Moses Todd getting closer, she moves on. She soon finds Maury, a child-like man who she reluctantly takes with her to return him to his family in Texas. On the journey, she meets various people good and bad, all living in this new world according to their own rules and values. Temple is a strong, resilient survivor and is a dangerous opponent in a fight. She carries and uses her Gurkha blade like a warrior, yet she is compassionate and kind and has a strong moral compass. She is an admirable and relatable character who keeps soldiering on no matter how hard her life gets but without ever losing her humanity. ‘The Reapers Are the Angels’ is written in a poetic way, it flows from Temple’s thoughts to conversations to descriptions of scenery with no break. The story itself reminds me of old western films, where there is a lone, dangerous yet righteous cowboy who travels the country, running from their past, yet doing good along the way. The language Bell uses also reflect this genre. Though it is an apocalyptic book and there are terrible moments in it, you never feel like there is no hope for humanity. The book is really a human story and its message is clear, zombies or no zombies, life goes on as always and so do people. « Shambling Towards Hiroshima by James Morrow (book review).